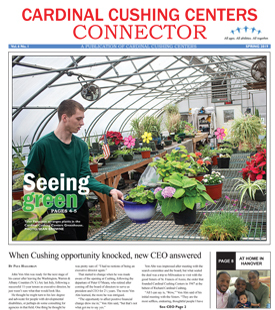 Thank you for your interest in Cardinal Cushing Centers Adult Services. We offer a wide array of day and residential programs including Employment, Community Based Day Supports, Day Habilitation, Shared Living, Adult Family Care and Residential. We adhere to the principles of Positive Behavior Supports throughout all of our programs. You will find our programs to be vibrant, progressive and person centered. I welcome you to contact me to learn more.